Record number of news stories exchanged on Asiavision. Kuala Lumpur, October 2016: Asiavision (AVN), the ABU’s daily news exchange network, has set a new monthly record for the number of news items exchanged. Members of the Asiavision Coordinators Meeting in Langkawi were told that in July more than 1500 items were exchanged for the first time in 32 years. The meeting - which was attended by more than 30 senior journalists - highlighted the importance of the role that each AVN member should play in the daily exchange of news items. ABU Director of News, Mr Chae ll, announced that new members are interested to join AVN. He added that this is an important platform to work together to share information and ideas in order to uplift the quantity and quality of the news items. AVN wants to enlarge its network and offer more and better services to its members. 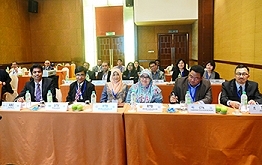 It has currently 30 members from 30 countries across the Asia-Pacific region.